A greedy landowner and his backward nephew conspire to block the only water source for an adjoining property in order to bankrupt the owner and force him to sell. A working man brutally loses both his job and his wife. He suddenly discovers poverty and is thrown in the street where he will meet tramps who will help him recover what he has lost. 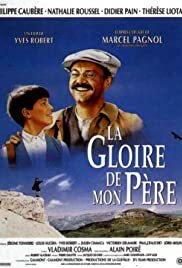 In 1930s southern France, a father is torn between his sense of honor and his deep love for his daughter when she gets in trouble with the wealthy son of a shopkeeper. Guy is fired from is job, and asks to stay with his friend and his girlfriend in their apartment. The longer he stays, the more disaster he creates. Augustine: You need your gun to go shopping? Joseph Pagnol: You never know. This, like "Jean de Florette" and "Manon Of The Spring" is the first of two French films that go together. The second part of this story is the film, "My Mother's Castle." See them both, but if you can only see one, my recommendation is "My Mother's Castle." As in many French films, this offers very little action and not much that is noteworthy but is filled with interesting characters and excellent storytelling. The French still offer that great storytelling, something that has slowly faded among filmmakers in other countries. This story is based on the memoirs of Marcel Pagnol, a very Liberal educator and atheist. His views are probably the main reason critics all loved this movie. They could identify. Despite the father's shortcomings, there is a nice appeal here as all the characters are interesting to varying degrees. I love the way they all express themselves, certainly different than we do here in North America. As with most of these French stories, there is very little profanity, too.